The troubles with Middies is that I got really used to the Neo/Kenner Blythe size. Because all of my dolls are on either stock or Licca bodies, there isn’t that much of a need to have a secondary wardrobe for a different body shape. This may be different if I found myself needing to dress for a Pure Neemo body or a Mimi Bobeck body. Unfortunately for Middie Blythes, they are naturally smaller than Blythe. Their bodies are a lot shorter and slimmer. Every single one of their features makes them just smaller than Neo Blythe in general – which they should be because they are a “little” sister – but it just makes for trouble with clothing them or keeping them in shoes because there is only so much one can do with trying to put Neo-sized tops as a Middie-sized dress, which isn’t to say that I don’t try to do that on a regular basis (because I totally do). Now the real question is: do I want to carry around a Middie at BlytheCon? On one hand, I may be tempted to buy things for my Middie dolls and that wouldn’t be a very good thing due to my personal challenge of crafting my Middies’ wardrobe (why do I issue out these challenges to myself?!). On the other hand, if anyone is selling shoes that could possibly fit Middie, I will have a model right there to try them on. Or perhaps I could just ask people to slap my hands if they see me reaching for a Middie sized dress (or shirt, or pants, or skirt…)? I’m not entirely sure how well that will work for me though – it’s always tempting to buy things at any BlytheCon (in my experience of attending two). Luckily, I will be limiting myself based on the amount of cash I have on hand. I won’t be buying any dolls, but I will be able to buy a few little treasures here and there! But if you were to choose a Middie to bring along – would you bring a Jackie Ramone or a Yellow Marshmallow? Middie Monday is a feature that is published on the first Monday of each month! A guaranteed monthly post on Blythe’s little sister – Middie! If you have any suggestions for a future Middie Monday post, please send me an email or use my Suggestions form! Kitty Brighton’s wearing: top/chelleshocks, capris/unknown. My vote would be for Jackie only because she was my first and I just love her. Hmmm I think my vote would go towards Yellow Marshmallow. Mostly because I’d feel more certain that whatever I try on her will most likely look okay on Jackie Ramone too, with her neutral colored hair. 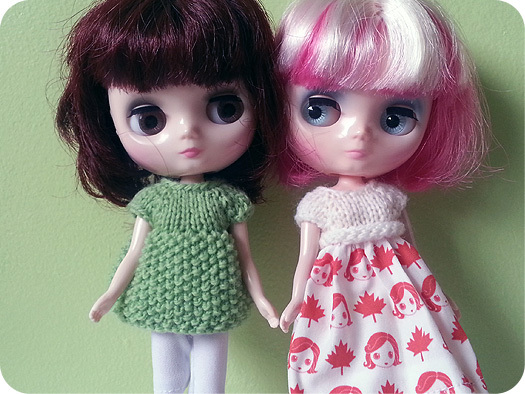 I got in Neo Blythe a year ago until Lydia Green Middie (named London) came to my house last June. I fell in love with her! I now carry my London and rotten spoil her. Easier to carry London around than my other Neo girls.